Great luxury townhouse in Old Town, short walk to everything This townhouse was everything we hoped it would be: a comfortable luxurious residence in a quiet Old Town neighborhood, just a few blocks east of Duval Street and a few blocks north of the beach. 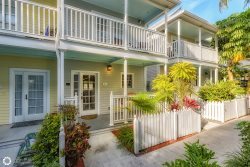 Everything was spotlessly clean, modern, and comfortable, and the rental staff at Key West Hideaways were friendly and capable. We walked to everything -- and when we came back we relaxed under the palm trees, in our own little heated pool. The house is part of a group of similar townhouses, so if you have partiers or little kids next door you will hear them when you are outside in the pool, but that comes with the territory when you're in Key West. We have stayed in several vacation townhouses over the years and the Windsor Townhouses are outstanding. Highly recommended. Excellent property, excellent location The property was very clean and very modern with all the conveniences. Private deck/ pool area with gas grill, private en suite bathrooms for each bedroom, washer/dryer, full kitchen with appliances. We had a party of 6 and this suited us perfectly. The property is only several blocks away from Duval so it's easy to bike/scooter to the nightlife action but is enough away that it's peaceful as well. There is a small market just at the corner and a CVS just up the street. Easy to bike to the beach from this property. We all had a wonderful time and can't say enough about this vacation home! Wonderful condo, great location My husband and I and a few friends stayed at this very well appointed condo in October. The condo was perfect for us. It is nicely decorated and laid out. It was clean and all the bedrooms had their own baths which we liked. It is also centrally located and we walked or rode bikes almost everywhere. We had to call the owner when we first arrived to make the upstairs bed a king and he was quick to respond and very nice and helpful. We had a great stay and would definitely try to stay there again if/when we return. Fabulous Find! Excellent accommodations! Clean, beautifully decorated. Great location. Easy walk to Duval. Enjoyed the backyard and pool. Would definitely stay here again! high tech home, nicely decorated, fully equipped - close to Duvall We came late on Thursday and Key West Hideways had keys and welcome package ready for us at their office drop box. We booked with Surrey and she was very pleasant, helpful and accommodating. The owner of Key West Hideways, Mr. Kevin came by next morning to check on us was also very helpful and accommodating. It is good to have that level of service and people who know what they do - you will be in good hands with them. Also, we booked the home 3-4 hrs prior to arrival - last minute deal and they allowed us 2 day stay instead of 3 minimum or 7 minimum as most places require - I am definitely going to use them always and recommend to family and friends. Six of us stayed including young baby and we were very comfortable. Home is amazing, loaded with all latest gadgets, free WI-FI, fully equipped, plenty of towels, washer, dryer, nice kitchen - because our girls like to cook and were impressed. Barbecue Grill in the back is also a bonus and works well. Private Pool Area is like a tropical garden with shade from the sun, lounge chairs - perfect for entertaining or chilling - I took a deep in the morning and they even had a floating mattress which is perfect to lay on in the middle of the pool. Size of the pool could be bigger, but still enough for 3 people to hang in. Duvall is 4 blocks away - so if you are looking for proximity and a quiet retreat from all the noise of Duvall - this place works very well. Parking was available right in front of the home. We had 2 vehicles and no problem parking. It felt good not to deal with parking on Duvall ST and be able to walk there.